Have you sent your Christmas Cards to friends and family yet? Now is the time to do it, and the price is right, free. These free Christmas card templates let you quickly open, modify, print and send. We recommend buying some thicker, quality paper of course, but that is about the only requirement here. 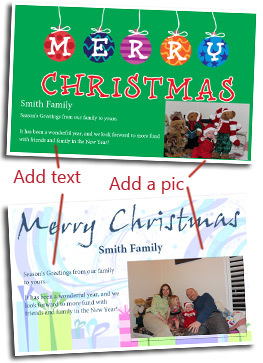 Several portions of the card can be updated online before printing including the header, text and an optional photo. 4) Print & Send Christmas Cards to family and friends! If you would like to review additional designs, make sure to checkout our greeting and invitation card section which includes more christmas greeting cards. Select your Christmas Card below. You can modify these cards in Adobe just like you would any document in Microsoft Word. Make the updates to the online Christmas cards as shown on the top of this page. Follow the text guides so you know where to click to add the optional photo (if decide not to add a picture, the text won't show up on the printed version). Print multiple copies of the Christmas Cards, as you can't save a version of your edited PDF file unless you have the professional version of Adobe Acrobat.